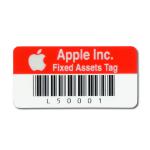 At System ID, we sell a lot of asset tags in every size, shape, color, and material. And trust us—it can be hard for customers to determine which asset tag (asset label) is best for their applications. That’s why manufacturers like Zebra, Datamax-O’Neil, and Honeywell Intermec produce a wide array of barcode labels in several types of different materials. This vast selection enables companies to efficiently track nearly every type of fixed asset, from office equipment and furniture to heavy equipment and manufacturing parts. To help you select the right labeling solution, here is a list of the most common asset tags and their preferred applications by material type. You may choose standard in-stock sizes, which we can preprint with colors, text, and graphics such as your company logo and address. Or, you can opt for a completely customized label or tag in any shape or size. There are literally hundreds of materials, adhesives, and treatments available to fit any application. So, if you need something specific, give us a call. Metalized matte silver polyester labels work well in harsh conditions and offer an affordable option to anodized metal tags. Important: Because this tag is metalized, it will conduct electricity; therefore, do not use it on the backs of printed circuit boards with electrical contacts. Note: This tag does not include theft-deterrent features. 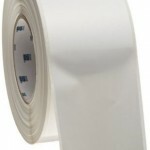 Gloss white polyester labels are the most affordable asset tag and are perfect for tracking office equipment and furniture. The affordable security silver VOID polyester tags prevent theft by displaying the word “void” if the label is removed. Note: Once removed, this label cannot be reapplied. 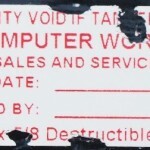 Desstructible reflective white vinyl tags tear apart when attempting to remove them, thereby preventing fraud. Resistant to abrasion and tears in industrial environments, LexSaver plus asset tags are one of the best for low surface energy (LSE) plastics and oily metals. 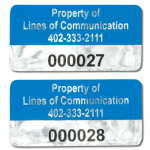 Anodized aluminum foil asset tags conform to most surfaces and are one of the most durable tags around, making them ideal for extended outdoor use. Note: The thicker the aluminum, the less label conformance and flexibility. 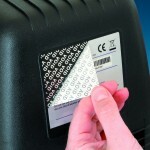 See “Best Barcode Labels for Manufacturing,” or refer to the System ID Barcode Printing Guide.